Variously referred to as “renowned”, “legendary” and a “TRUE MASTER” of animation, Barry Purves, a stop-motion animator and director with more than thirty years’ experience, has just written AVA’s latest Basics Animation title, Stop-motion. Cartoon Brew‘s Jerry Beck refers to it as a “great read” from “master animator Purves”; an “absolute must-have”. 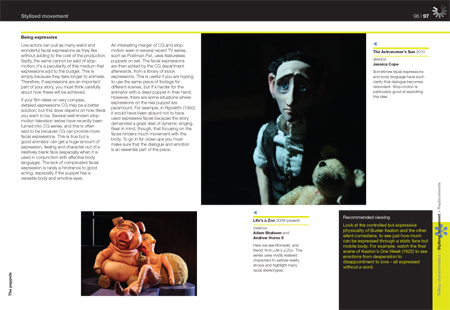 Stop Motion Magazine is also calling it “the must-have book for the stop motion animator”. Although an extremely busy man – a recent peek at his schedule revealed a trip to the national Film school, a festival in Ipswich, a workshop in London, and a quick trip to Estonia for a festival – he has kindly answered a few questions for us about his work, his favourite animators, his views on the industry, recommended resources and festivals and basically anything we thought would be of interest to animation enthusiasts. Barry puts a lot of time and effort into responding to those with questions on his website and we also asked why this is so important to him. You can visit Barry’s website here. The header image of this post is from Barry’s 1996 film, Achilles. The cover image from Barry’s new book is taken from the film Madame Tutli-Putli, 2007, discussed in the chapter on puppets. Watch this fascinating short video explaining her amazing human eyes. Can you tell us a bit about any projects you have been working on recently? Yes, I am just about to move to France for four months to film a short 15 minute film called Feather, and hopefully there is a film lined up with a Russian company and another French company after this. Happily after a tough couple of years interesting projects are coming in, though not from the UK. I have also been doing masses of teaching around the UK and around the world. Do you have a favourite stop-motion film? Well it’s hard to be judgemental about a stop motion film but I would say Mary and Max by Adam Elliot is probably the best stop motion feature I know, by its sheer emotional impact. It may not have the slickness of other features but it has a huge heart. Who are your favourite animators? Again, Adam Elliot for making brave, unique films about people who haven’t made it, and not bowing down to commercial trends and formula and the latest special effects. 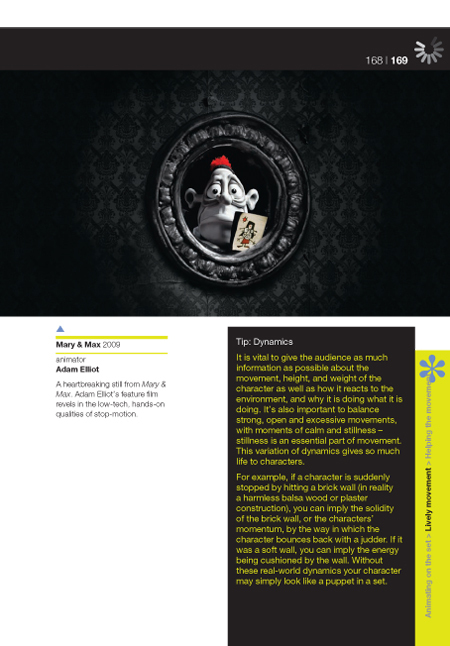 Stills from Mary and Max are featured in Basics Animation 04: Stop-motion. When you were first starting out, did you ever experience a defining moment – this is what I want to do? It was probably the ‘Lonely Goatherd’ scene from The Sound of Music, where Maria and the children put on a puppet show. Not only were they having such fun enjoying the creative process, even as an eight year old child I realised that this scene in the film was being used to say something about the relationships of the main characters. And that is the secret I guess – using the distancing of puppets to comment on the behaviour of characters – behaviour they are either blind to or are unable to acknowledge. What was your first job in animation and what kind of tasks fell under your responsibility? My first day at Cosgrove Hall was animating a puppet character called Grandma Bricks. I had enthusiastically talked my way into a job there without actually having worked with puppets before. I had to walk Grandma down the length of the street, and she was fine other than walking putting her toes down first instead of her heel. A major learning curve about observation and understanding movement. I enjoyed the thrill of having to get it right, especially without the luxury of any video playback. What do you think is in store for forms of animation such as stop-motion? Oh I think stop motion will be around for a long time as long as it will be allowed to be stop motion and not have to pretend it is slick CG. There is a trend for enjoying the quirky technique. As CG gets more sophisticated some audiences are enjoying seeing something simple. Most theatres are getting away from huge technical illusions and enjoying the contact of actor and audience again. 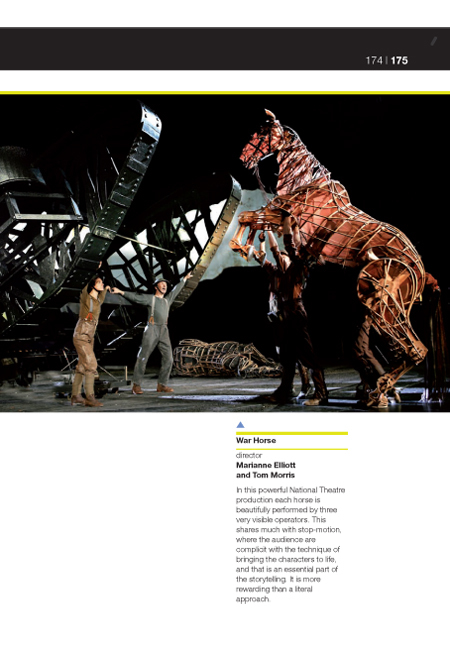 War Horse, where the horse puppets are operated by very obvious performers on an empty stage is a prime example. We enjoy seeing the simple trick. The advent of CG was thought by many to spell the end of forms of animation like stop-motion but they seem more popular than ever. Why is this? CG does realist animation better than ever stop motion could do, so stop motion, especially in films like Fantastic Mr Fox, is being allowed to enjoy its quirky technique. I see from your website that you have “directed and animated some 70 commercials, title sequences, animation inserts for films and pop promos”. Which of these do you prefer as a general rule? Oh commercials can be a great burst of creativity, and a chance to play with new techniques and ideas, and I would like to do more – even if you have to swallow hard sometimes at the amount of nonsensical jargon spoken in creative meetings. And you have to adjust your thinking to realise that clients are really only interested in their product looking good and not necessarily about any artistic qualities of the film. I’d like to do more music videos, especially for classical music. 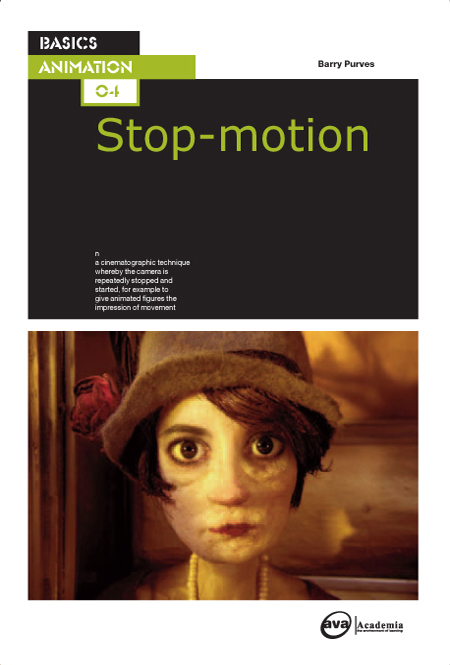 Your book on stop-motion for AVA was your second book on this genre, what is it that fascinates you about it? And do you enjoy the process of writing? There have been some very dry books about animation, and many written by non-practitioners. I enjoy trying to write in a no-nonsense way, and in my own voice, with my own experience. I want to try to get the reader thinking for themselves, combining the practical, the realistic and the artistic. What should aspiring animators be doing to be heard? The more films they can make the better, and the more they can work with experienced animators the better. They have to realise that they won’t come out of college and straight into their first feature film. If they get involved with a studio, the security that offers will allow them to experiment on their own. Most short films are made in downtime between production on big features at studios. How valuable are websites such as YouTube for young animators? Fantastic, but I have to say watching an animated film on a computer is not the same as watching it on a big screen at a festival. 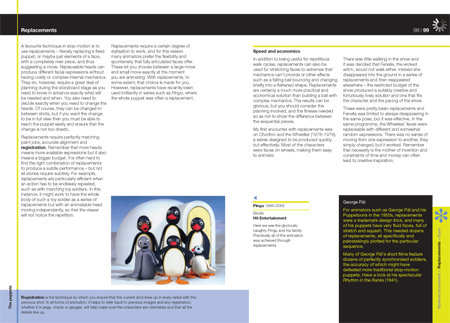 What is your advice for animation students – what are the best ways to get some practical experience? Don’t be too proud to take advice, and make everything you do ‘read’. Do it simply and clearly, and get the story across. 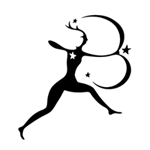 Open your eyes to other ways of storytelling – go to the theatre, learn to dance, watch ballet, opera, film, everything. Animation is not a bubble – learn to work with other people. It’s a myth that animation is a solitary affair. Would you recommend studying animation formally and what do students tend to get out of these kind of courses? I didn’t have any animation training, but managed to gain a lot of experience in a nurturing environment at Cosgrove Hall. I would certainly have appreciated some training about cameras and CG, but I think colleges are good for focusing a student into thinking about what works or doesn’t for them. What are the best websites and resources for aspiring animators? Is it helpful for students to attend animation film festivals – are they good opportunities for networking and gaining inspiration from the work of others? Go armed with DVD’s of good showreels, and be friendly but not intrusive or pushy. Follow up any contacts a week or so after the festival, but don’t make too many demands of producers. They will watch the DVD in their own time when they can. Watch any and every film you can. Do you think writing Basics Animation: Stop-motion influenced the way you view your working process? It’s certainly helped me think clearly about what I do, and it has also made me realise I still have a lot more to say. Do you think it’s important for anyone interested in animation to know about all the different aspects of it other than the ones which they intend to be involved with? Oh yes, and there is not cut and clear line between techniques, and it is all about finding the right technique that is appropriate for the story. Yes there is an attitude that you simply have to be using the latest software or technology, but at the bottom of everything we are storytellers, and if the story is told in an interesting manner, whether it uses technology or puppets, then that is all that matters. Technology is not a dramatic element in itself. I have also seen talk of “the 12 principles of animation” – what do you think are the most important lessons for an animator to learn? Well I will just repeat my mantra – let it read. How is the animation industry changing? And is it for the better or the worse? Children’s television has changed for the worse, that’s clear, but there are a satisfying amount of features being made. The standing and access to short films has changed for the worse, especially from broadcasters who don’t give them airtime. From your point of view, what are the best and worst jobs involved with animating? The hardest thing is having to raise the money, to beg for every penny, and to justify everything. The utter joy is the shooting of the film. What kind of stories do you think make the best animations? Ones that use the technique to liberate themselves, using every element of the medium (colour, music, movement, design, editing, etc) to tell the same story. The worst are those that copy live action. Animation simply is not live action, nor can it ever be. Celebrate the artifice. You keep an online diary, with regular updates, and make a concerted effort to respond to students and others who post questions. Teaching seems very important to you. Why is this and what do you get out of it? Well I certainly don’t want to be like the major companies that cannot be bothered to acknowledge job applications, whether it is from a student or an experienced animator. There is simply no excuse for that, and I am certainly speaking from experience there… A lot of people helped me and it’s satisfying to help others. Well it can be seen as helping but it is also about sharing a passion. You would hope that those you encourage appreciate, but sometimes I do get frustrated when you have spent all weekend writing pages for a student’s dissertation and then never hear from them again. I do try to watch every film I am sent, and it annoys me when I have missed one through the sheer number. To keep working, making films that I hope people will enjoy; films that offer a new perspective or a new way of storytelling, and to keep being creative. I would like to do more crossover work with the other arts. Seeing such stage productions as the new Andrew Lloyd Webber musical Love never Dies, it momentarily hurts that I didn’t get the job of doing the animated projections. I know a lot of my skills can be applied in different ways, and I would love the other arts to see that. And of course I would be very happy to finally get to direct a feature. War Horse in the West End to me is a pinnacle of the meeting of different arts, and it’s certainly something I could have done, and I approached several companies about a similar project, but they looked at me, and animation, with some confusion and condescension. Images in this post are taken from Barry’s new book. More information on it is available on our website. Barry is now working on a new film called Tchaikovsky – and you can see a video of him in the middle of the process here.